Vidyala over at Manalicious just wrote a post called "Then and Now" in which she credits her inspiration for the post to Hya from Gkick (who posted some screenshots of her toon, here and here) and the recent "Sixth" meme that had been circulating. I decided to do a quick check and see if I had some old screenshots on my Photobucket account to participate in this, and I had the perfect set of photos for this. 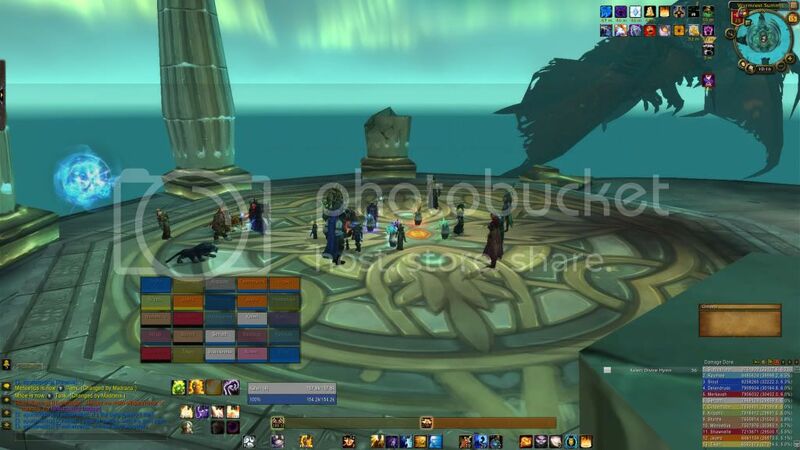 To start off, here is Kaleri in her first 25 Man raiding guild, < Forever or Never >. 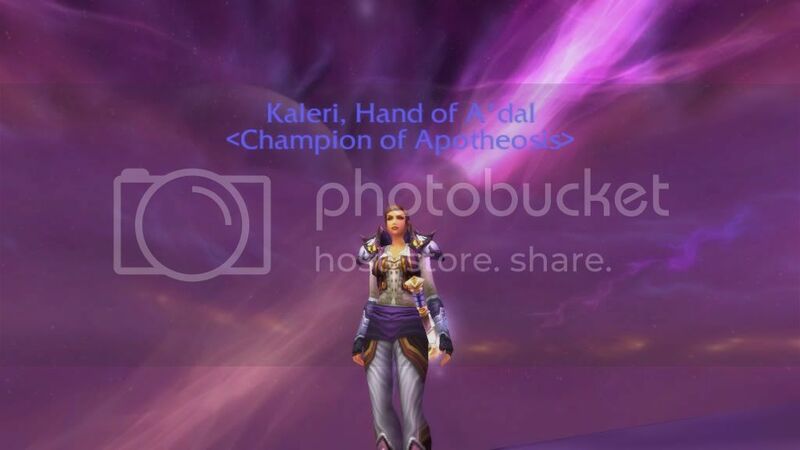 Here she is now in her current 25 Man guild, < Apotheosis >. Some differences here; Kal is now a human and has been one since the Firelands was introduced. Since then I've enjoyed having Every Man for Himself and the free reputation from Diplomacy. I am no longer shadow spec'd, and haven't been actively shadow since just before Ulduar. What is similar is the background - I LOVE the Netherstorm sky - and interestingly the shoulders. Shadow Kal is wearing the Mantle of Nimble Thought, and Disc Kal has her shoulders transmogged to the same model. Also, look at the titles. 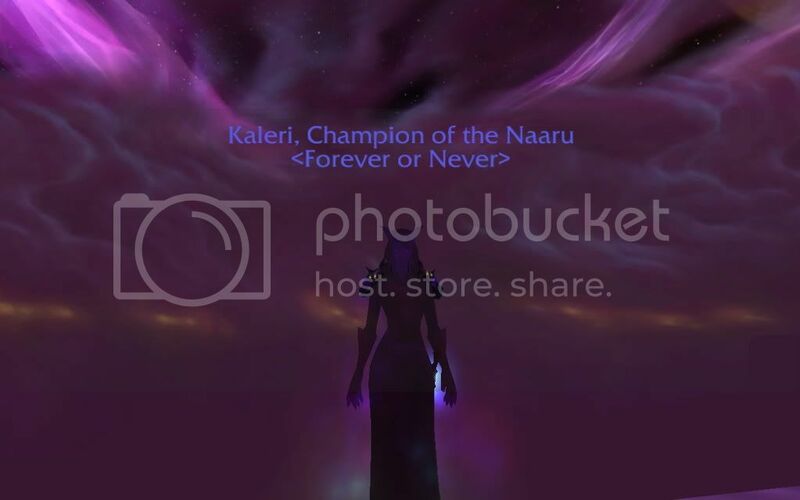 At the time, Shadow Kal had only the Champion of the Naaru title available and I've proudly displayed the Hand of A'dal title since I achieved it in 2008. 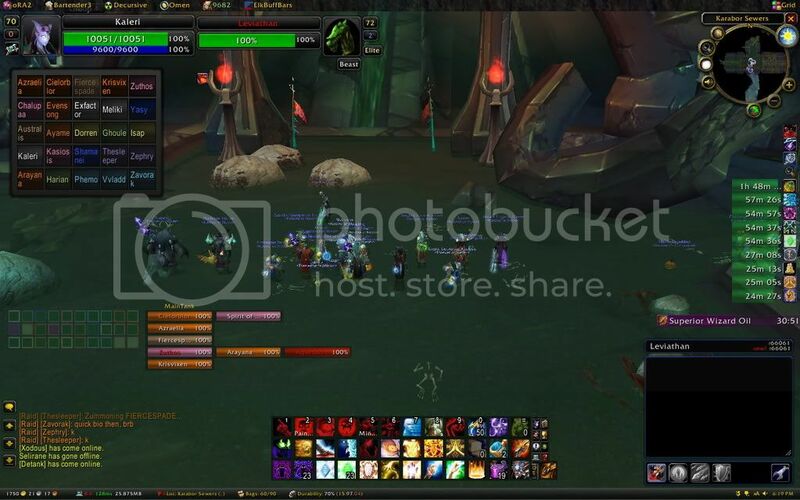 I thought it would be interesting to check my old raiding UI and compare that with my current UI. This is one of my very first forays into a raid with < Forever or Never >. 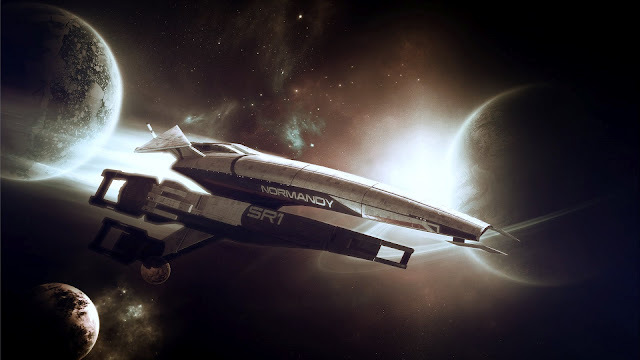 Look at those buffs! Superior Wizard Oil?! Ay yi yi. Xperl, a very unconfigured Grid, and a really weird looking Bartender. Look, there's Decursive! And Ora2! And Elkano's Buff Bars! Much better. I'm not really sure what the Omen meter is doing over there on the right, normally it's next to my Recount. Since my first Black Temple trash run, I've cleaned up my UI quite a bit. I properly configured Grid to suit my needs, installed and took to Clique like a bird to flying, got rid of the hideous-looking Xperl and overall made my UI much cleaner and much more conducive to raiding. 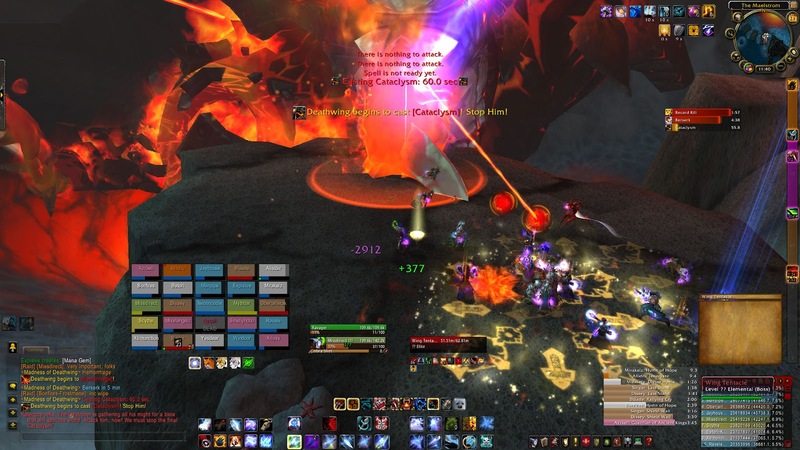 I'm much more 'serious' about the way I play WoW, I play to raid and have left a guild where they decided to stop raiding six months (SIX WHOLE MONTHS) before Cataclysm. I've learned a lot of things since 2007. I still like to tell the story of how I applied to my first serious 25 raiding guild. I was in Forever of Never as an officer and stayed until the guild dissolved. I was looking at the WoW Forums for Bronzebeard and saw that Resurgence was recruiting. Since FoN was effectively dead, I sent the recruiter (a holy priest from Australia named Heavenley) an in-game mail inquiring about the recruitment process. I was fortunate enough that he sent me a tell later that day asking to meet up in Ironforge to look at my gear and that he wanted to speak with me on the Resurgence Ventrilo server. He asked about my raiding experience compared to where Resurgence was progressing (they were going for Archimonde that evening) and I told him that I'd only ever been as far as the trash in Black Temple and Hyjal. They must have been pretty desperate for shadow priests because they took me on that day. The great thing about Resurgence is I met my current boyfriend and some great people there who are now also in Apotheosis. I am very much looking forward to the next WoW expansion, and I can't wait to see the changes it brings. I'm finally able to get around to doing this. Cymre over at Bubbles of Mischief tagged me in this post to participate in the new 'thing' that's been going around lately. Unfortunately all the really cool screenshots I had have been wiped when my PC died a few weeks ago, so I really had no motivation to do this. But I figured why not, and decided to check what screenshots I did have. This is my hunter Missdirect doing an LFR with a few friends of mine. Quick edit here; I won't be tagging anyone else with this - the people I would have chosen have already done this by the time I got these up.